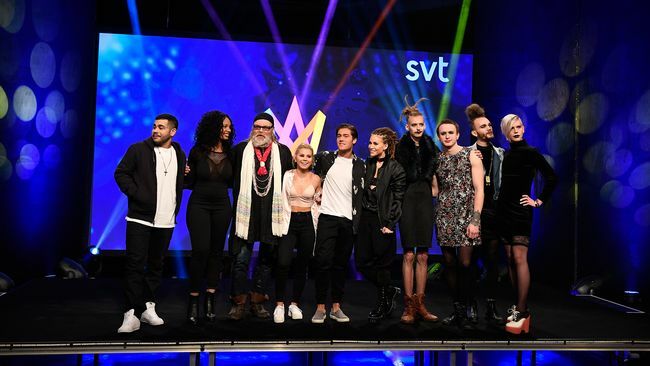 Linköping was the venue for Melfest's Andra Chansen. Of course this meant the duels, which I personally feel are a very unfair way of selecting the remaining finalists. I would prefer a straight-up 8 song heat with the top 4 going to final. but Christer and SVT prefer to jazz it up, and try and bring some excitement to an otherwise mainly boring set of songs. This week's postcards featured the artists in each duel watching and listening to their rival. By the looks of it there was a lot of love there though! Duel 1: "Gotta Thing About You" - FO and O vs "Road Trip" - De Vet Du. 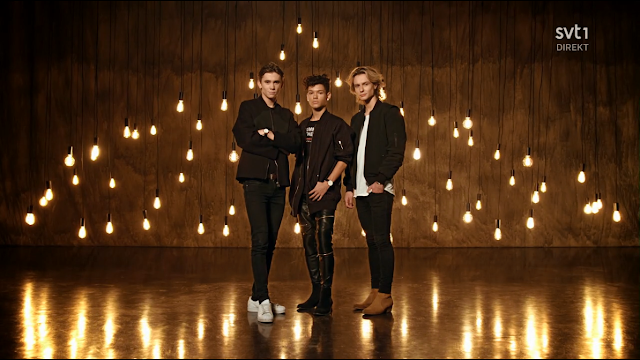 So the boyband fan in me wants to like Foooooo-whatever-they're-called-this week but for me they are completely lacking in appeal and charisma. 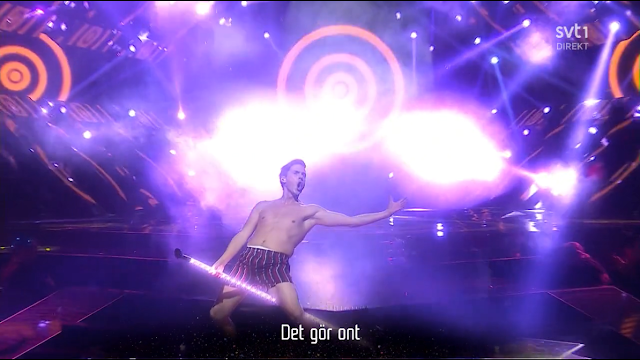 Oh, and those lyrics are still terrible, verging on parody, no wait, they are beyond parody, more than any "parodi" that the Norbergs will ever come up with.De Vet Du are a one-joke joke, but at least "Road Trip" is a fun song and a bit of effort has gone into the visual presentation. It's very entertaining although if I'm honest, none of these really deserve a place in the final. Duel 2: "När Ingen Ser" - Axel Schylström vs "I Don't Give A" - Lisa Ajax. I was Team Axel all the way here, his song was old-school uptempo Melfest boy pop which now seems to be an endangered species in the contest. Extra points for a native language song too. Axel performed it with energy, professionalism and class. 'Class' was not a word I would ever use to describe Lisa's song which is not the best song which The Family (the Debs-and-Anton) have ever written. The standards are slipping. it was just desperate and the song and staging were unlikeable. We then had a musical "mean tweets" segment from David Lindgren...ending on David for the win! Duel 3: "Her Kiss" - Boris Rene vs "Hearts Align" - Dismissed. The reason I find the duels system unfair is that depending on the draw, inferior songs can go through from one duel, at the expense of better songs from another duel. I would have liked both of these from duel 3 to go through. Next came the Zeynos dry cleaning sketch and my only answer was....why? (By the way, completely boring fact alert - that cream-coloured curtain was the very same as the curtains in my house). I really didn't understand this sketch, apart from being a vehicle for cameo appearances by Christer and Afro-Dite. 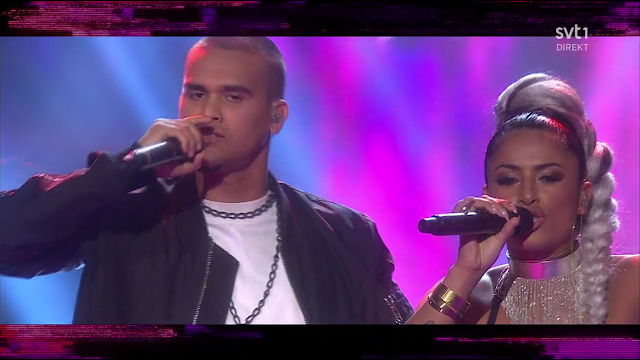 Duel 4: "Kiss You Goodbye" - Anton Hagman vs "Statements" - Loreen. The story so far: Loreen never made it direkt till final but by the time of Andra Chansen the general view seemed to be that everyone had seen and heard "Statements" enough to get used to it. However, foregone conclusions are never all they seem! The "app heart" crackled away during Anton's song but hardly made a move during Loreen's song. That should have been a big indication of how the result would go. 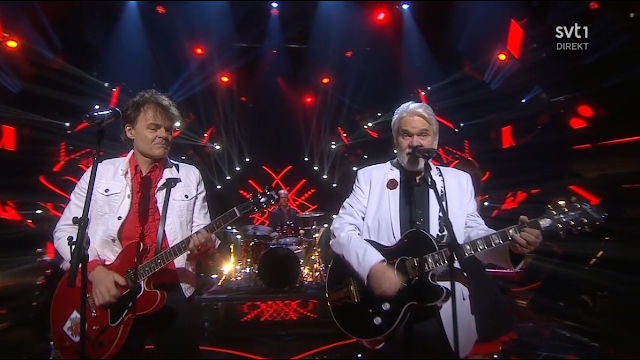 This week's interval act was the duo of Daniel and Emil Norberg with an exclusive preview of the final in their well-known "parodi" style. I always enjoy this type of spoof and let's face it, Melfest can be a very good target for parody! 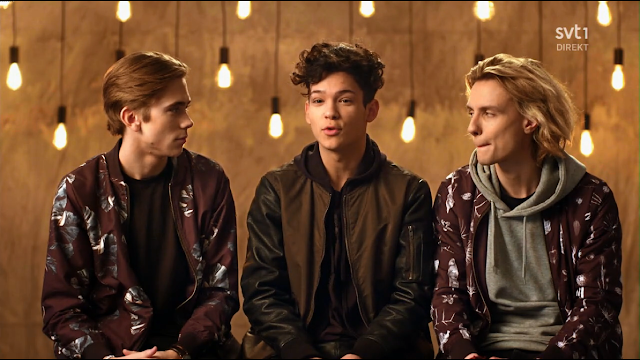 A quick chat with Norway's commentator Per Sundnes before the next interval act, Linda Pira and Dani M - an interesting choice given that the "urban" performers in this year's Melfest didn't do very well. 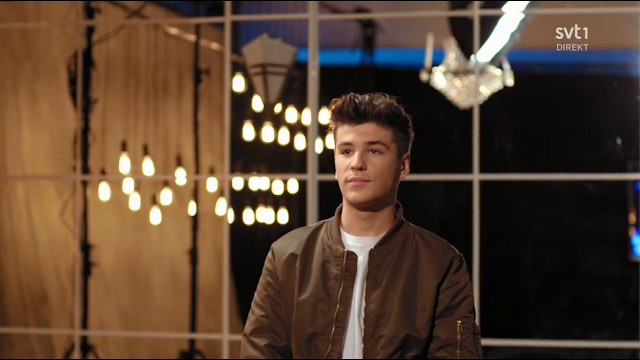 I wonder if Linda or Dani will take their chances in a future Melfest? 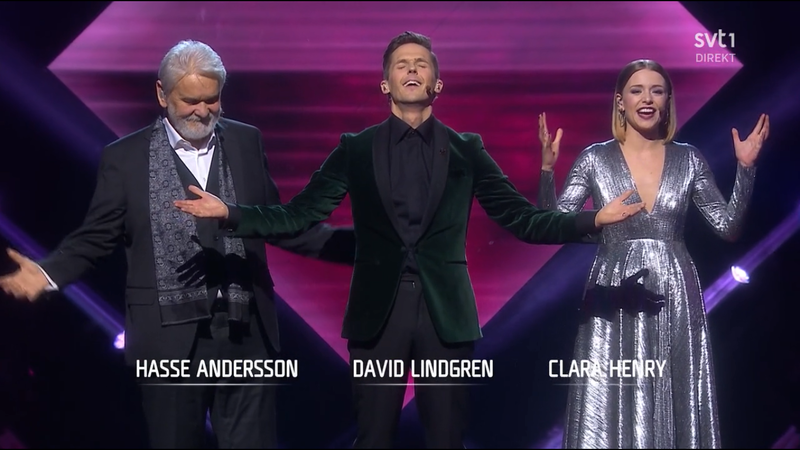 David Lindgren's green room serenades have become a big feature of this year's contest and this week it was the turn of "Stad i Ljus" to get the Lindgren treatment, With that very long note at the end! FO and O (pronounced Fo and o) beat De Vet Du, which I wasn't too happy about. Although "Road Trip" was a novelty song, it was also good fun, whereas "Gotta Thing" was (and is) the most embarrassingly bad boyband song which my ears had suffered in a long time. Lisa won duel 2, beating Axel. (Not happy). Boris won duel 3 - but was then drawn into the running order "slot of death" - 2nd in other words. 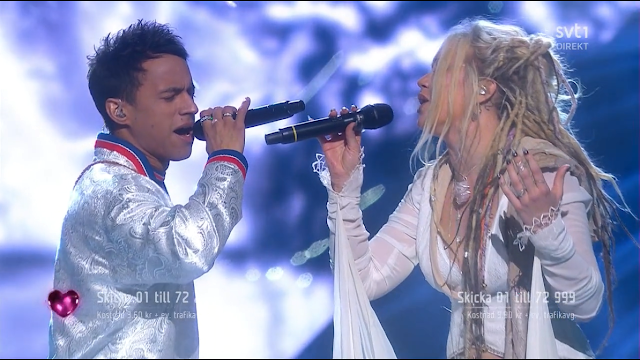 And finally....the result of the Anton v Loreen duel was revealed - and it was Anton who was going direkt, not Loreen. 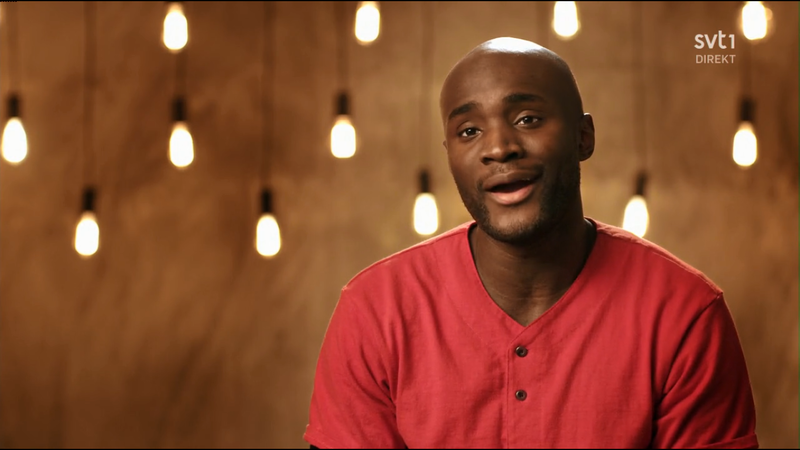 Anton was drawn to sing in 6th place in the running order in the final. Melfest season had started off with a big surprise - the return of Loreen - which was threatening to turn the contest into a foregone conclusion - but then came that shock result. 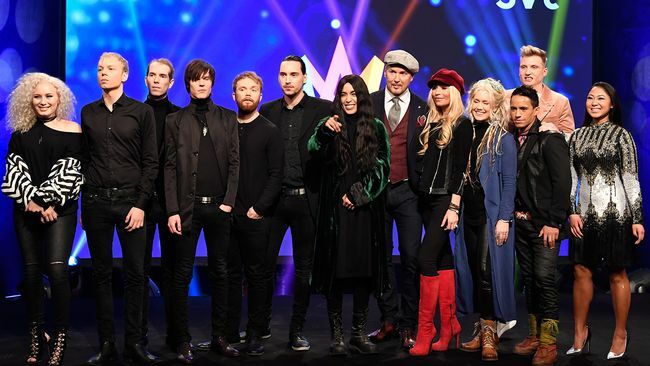 By the end of Andra Chansen, the final line-up was known and it looked as if either Wiktoria or Nano would get the ticket to Kyiv. More surprises were to follow! 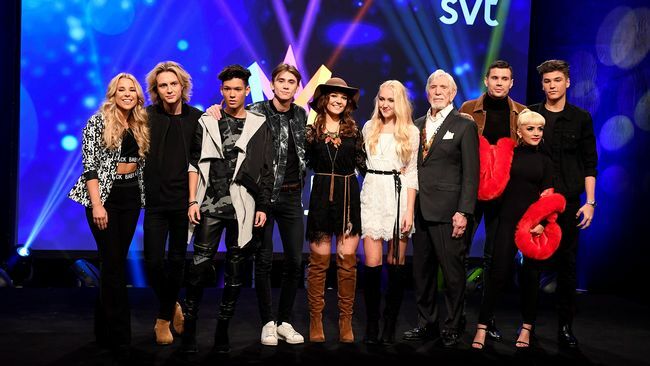 A couple of weeks ago, Melfest paid tribute to Hasse's home region. 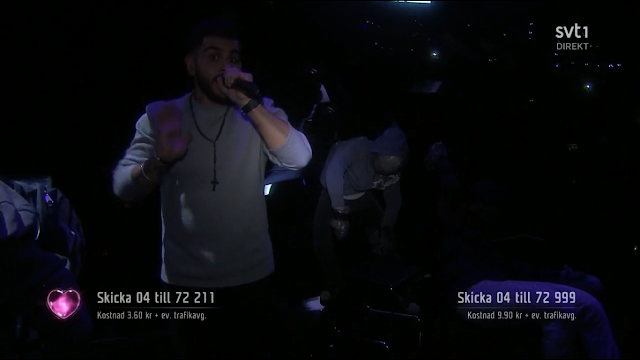 Now it was the turn of Skellefteå native David Lindgren to pay tribute to his home city - a very lively "You Can't Stop The Beat"-style opening number "i Skellefte"
By the way, for the first minutes of the show, SVT gave us all a fright with the 'broadcasting is temporarily unavailable' message. 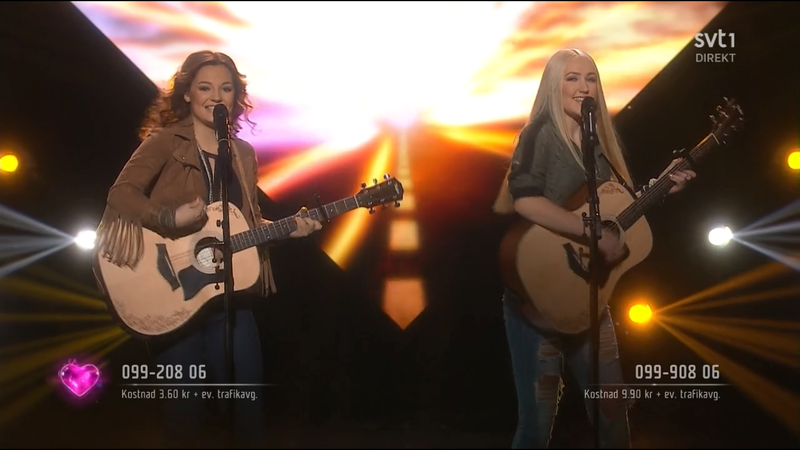 There was also some competition tonight from Dansk Melodi Grand Prix. Now, I would usually watch DMGP but had made the decision not to watch the full show, purely based on my lack of enthusiasm for the final line-up of songs this year, but just caught the superfinal later on. 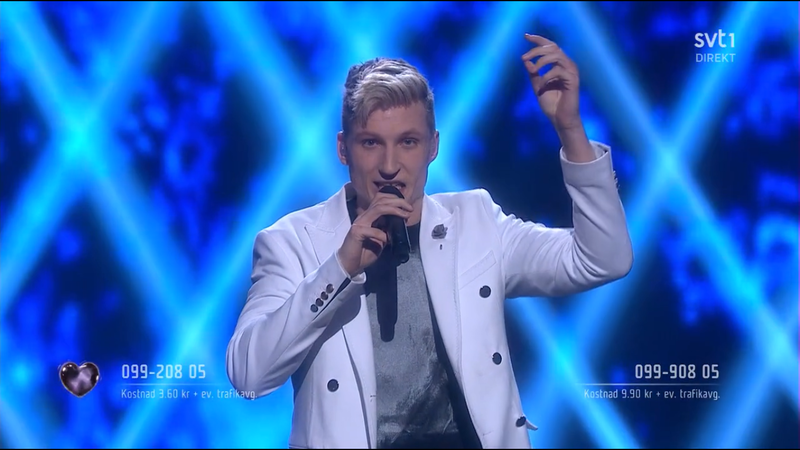 Finals were also taking place tonight in Moldova and Ukraine. 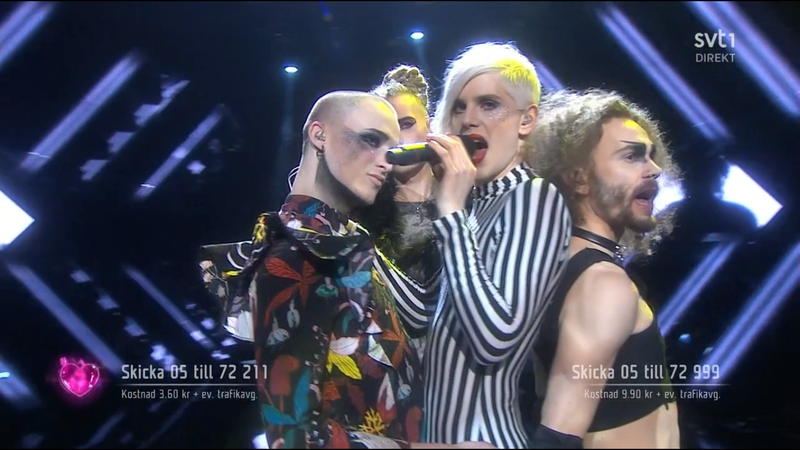 But back to Melfest. Connection restored and time for this week's line up of songs. "En Värld Full Av Strider" - Jon Henrik Fjällgren featuring Aninia. But what about the song? Well, it was very mystical, with magical and epic staging. I had quite a bad time during the week in the lead up to the 4th semi-final, so this song was just what I needed. I was floaty, and pretty, the audience waved their lights in the air and there was even a key change. A bit too much oversinging by Aninia though, who has the wind machine turned up to 11. I think we may see her again in Melfest. They hugged at the end. Awww. "Running With Lions" - Alice. 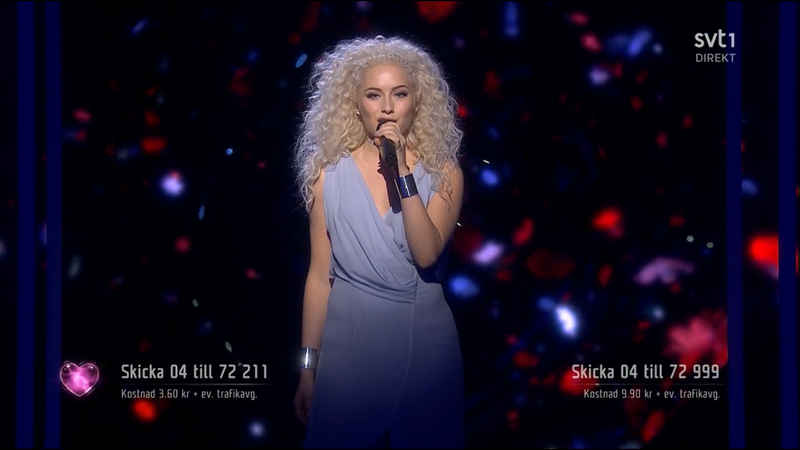 Another former Swedish Idol contestant. Alice sailed through Stockholm in her postcard. "Running With Lions" was another song in that very on-trend modern-midtempo style a la Sia. 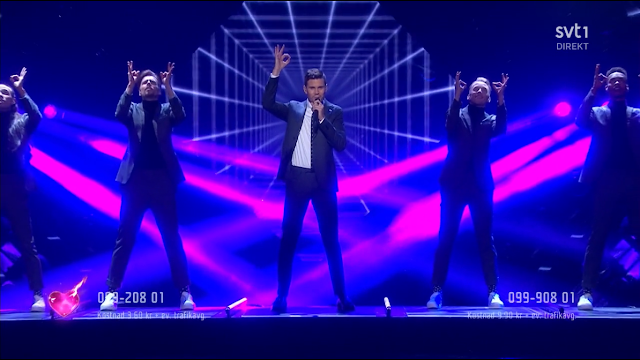 Flippin' eck, there are even lyrics inspired by Titanium here ("shoot me down but I get up"). And you know what I think of Titanium...ok I'll shut up now. Alice is likeable and it was quite an ok pop song but not too memorable. There were some good bits in it though and I might listen to it again. Tonight's show seemed to have a nod to the Melfest of old, as the wind machine was working overtime again. 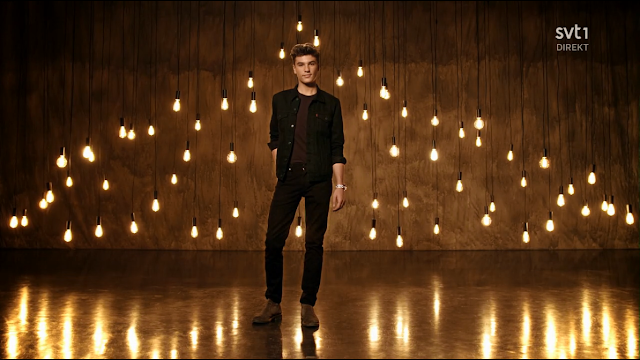 "Bound To Fall" - Les Gordons. Chosen from the preliminary Svensktoppen Nästa round but surprisingly not in the 2nd song 'draw of doom' slot for a change. 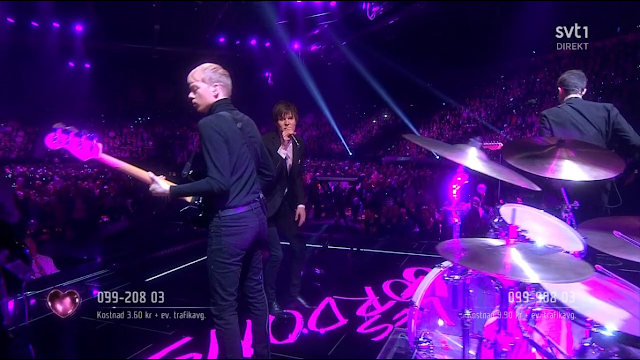 Les Gordons are a sort of indie rock band - there are so few rock bands in Melfest now, so let's appreciate a bit of much needed musical diversity. This wasn't much of a song but it was ok.
"As I Lay Me Down" - Wiktoria. 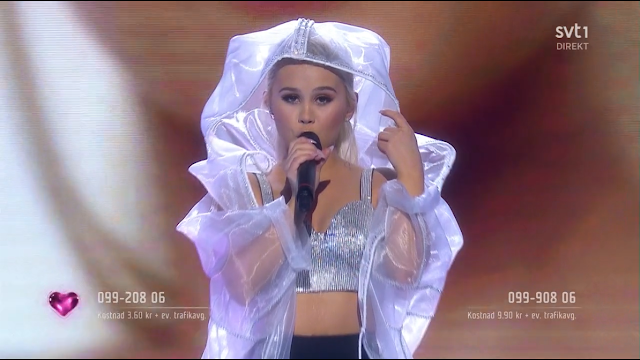 After her reasonably successful debut last year, it was inevitable that she would return to Melfest very quickly and see if she could improve on that 4th place. She wasn't wearing the projection-suit this time although that stupid logo made a brief appearance just to remind us of last year. This song was another country-flavoured pop song, a bit more appealing than "Save Me" but the one thing which still annoys me is her tendency to over-sing. So I concluded that I would probably like this song better if it wasn't belted out so forcefully. "När Ingen Ser" - Axel Schylström. 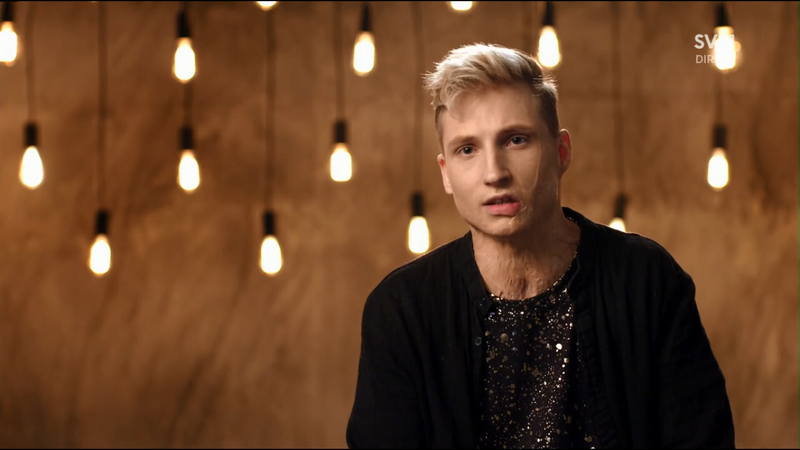 Axel, yet another former Swedish Idol contestant (from 2015) is a real survivor with an incredible back-story: 70% of his body was burned after being electrocuted in 2012. 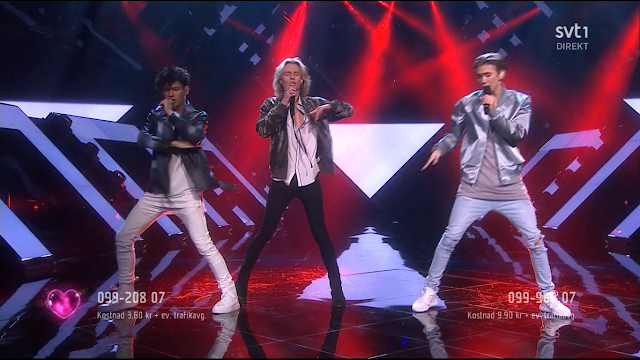 With this song, Axel brought back the upbeat boy-pop which was once a regular feature in Melfest. This was an energetic number which I thought had a little bit of the "Don't Worry" about it. Lively and well-performed, and well-deserving of a place in Andra Chansen. "Du får inte andra på mig" - Sara Varga and Juha Mulari. Sara is like the anti-Wiktoria - a singer with a small voice. 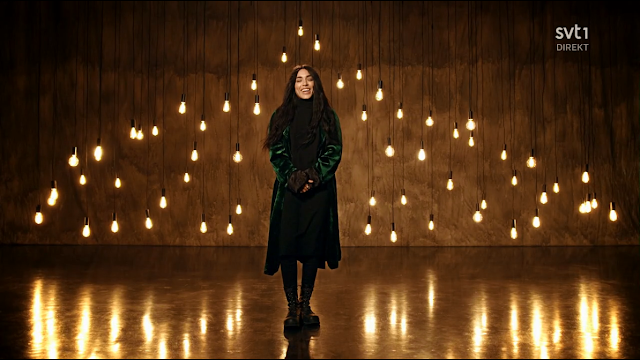 This song was the calm before the Loreen storm, but unfortunately it was a real sleeping pill of a song and had no real redeeming features. How did this make the final 28? 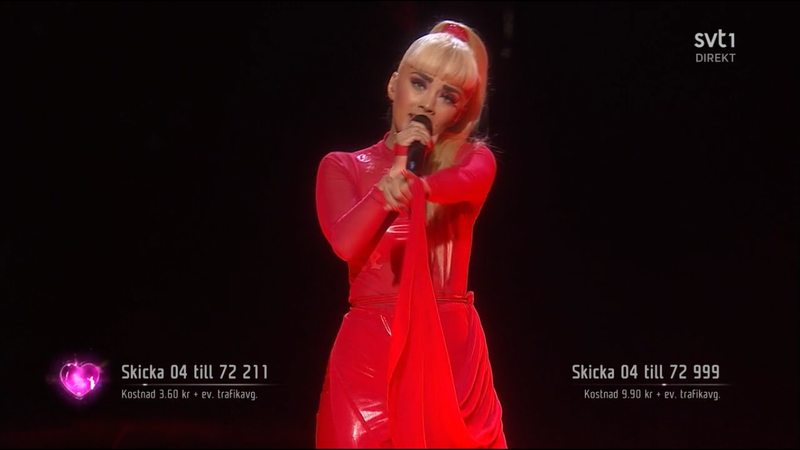 Sara was very different looking from her last appearance on Melfest, dare I say: I think it was fair to say that she has had "work" done. Quite a lot of work. I hadn't had the chance to listen to the song clips for heat 4 so this was my first listen on the night. On the one hand, it was a compelling performance piece - obviously Loreen attempted to create yet another "everlasting piece of art". But on first viewing/listen it just came across as deliberately obscure and incoherent. The song was called Statements, but I couldn't make out any of the unintelligible lyrics. If there was a story or a point to be made, it struggled to get through. 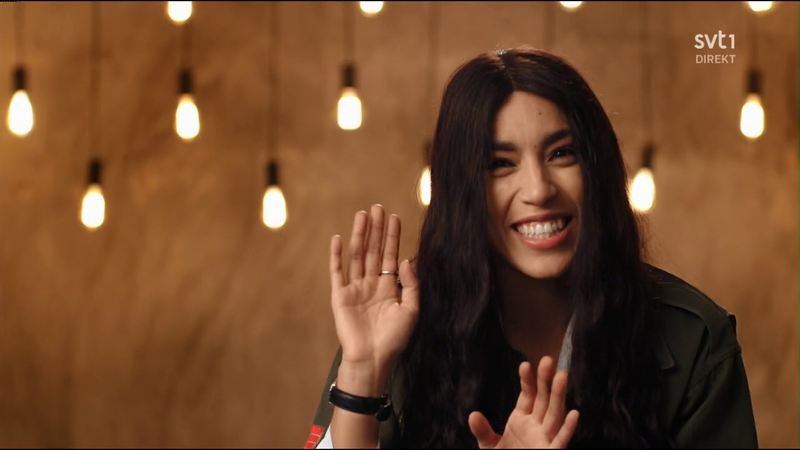 That was only my view; many Loreen fanatics were lapping up the song with glee and declaring it the best thing since "Euphoria". 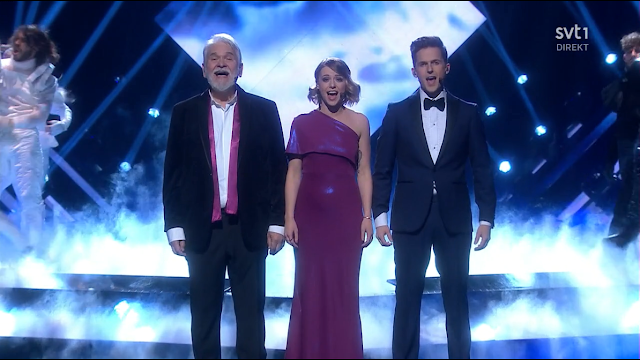 Just what was the point of that Zeynos drycleaner sketch, apart from an excuse for some Melfest cameos from Lill Lindfors, Anna Book and Tommy Nilsson? The question in everyone's lips was....just what would David do in the green room tonight? As it turned out, he sang a song to the tune of Bra Vibrationer and produced his scissors. And then Hasse threw iced water over him. I guess David was just trying for a few GIFs this year? 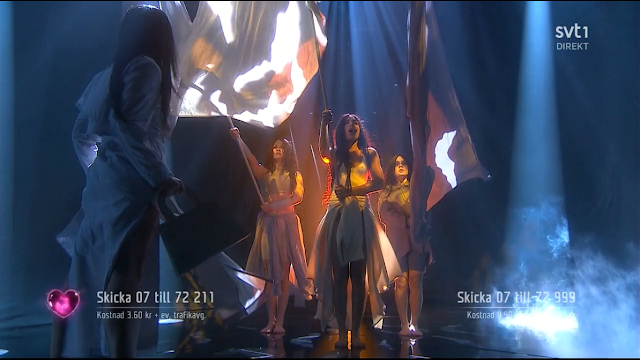 Needless to say, there were frenzied reactions on social media to Loreen *only making it to Andra Chansen*. 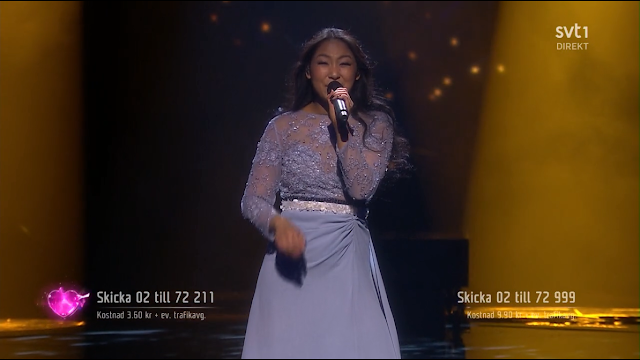 But she's Loreen, the Melfest/Eurovision legend, and this song will grow on people, and by the time next week comes, everyone will love it and it will completely walk Andra Chansen. As for me, I watched the clip and listened to "Statements" quite a lot in the lead-up to Andra Chansen. The song grew on me, and I probably came to the first of the above conclusions. Not for the first time, I would be very, very wrong......! This week: three returnees (Mariette, Lisa Ajax and former winner Roger Pontare) and four debutants. As ever, the Swedish tabloid press was keeping a close eye on the proceedings, monitoring every line of every script and every musical number. 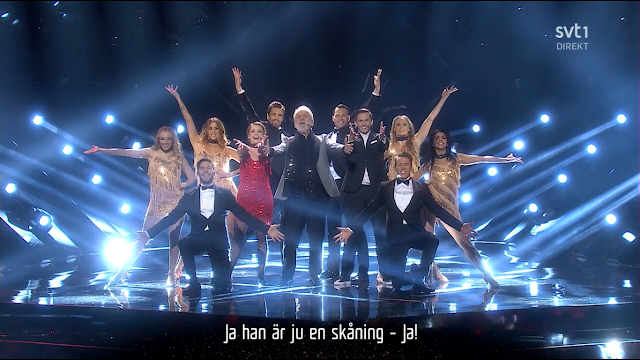 This week's opening number, "Han är en skåning" was a tribute to the unique accent Hasse Andersson and the area of southern Sweden where heat 2 was taking place - but the general view of the press was that it was cringeworthy. I didn't really enjoy it either and it overstayed its welcome. "A Million Years" - Mariette. 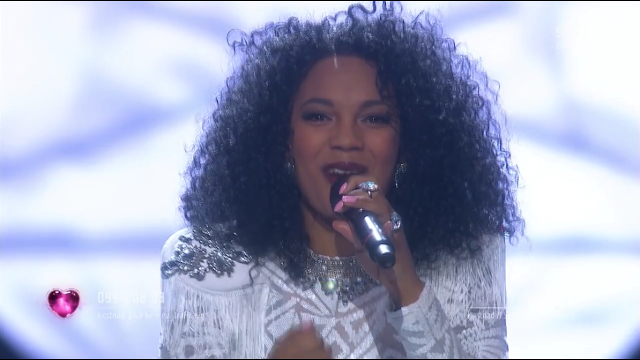 Mariette made her long-awaited debut with something more uptempo than her debut song. She absolutely deserved her qualification. 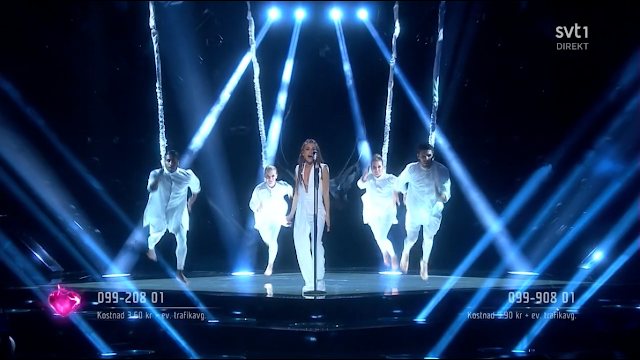 She was one of the most talented artists in this year's contest, although the staging for me left a lot to be desired: backing singers/dancers hanging from bungee cords, were later to be mocked in Daniel Norberg's annual "Parodifestivalen" sketch. "Himmel och Hav" - Roger Pontare. Fire! Traditional clothing! 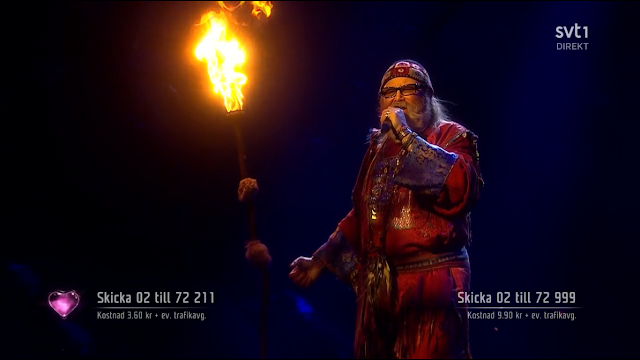 Dramatic Swedish anthemic music! 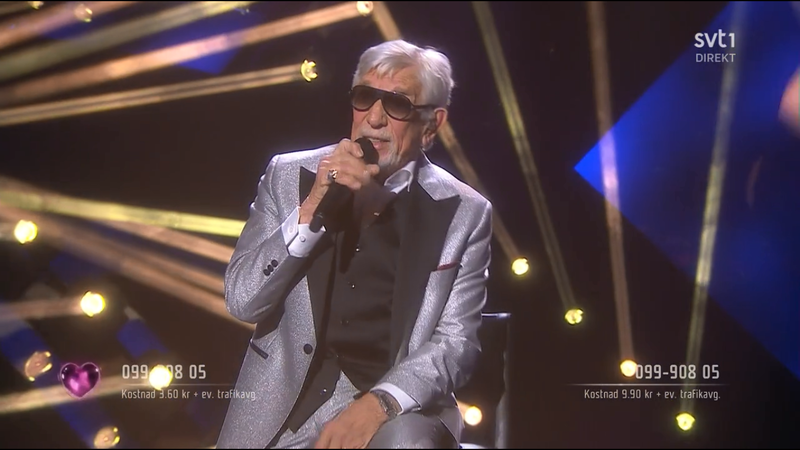 Yes this could only mean one thing - the return of the legendary Roger Pontare to the Melfest stage. Many (myself included) were of the view that Roger should have at least got a place in Andra Chansen, This was Roger effortlessly doing what he does best. An energetic debut for Etzia with a song with a similar style and feelgood factor to "Kizunguzungu" from last year. Dancers on roller skates. 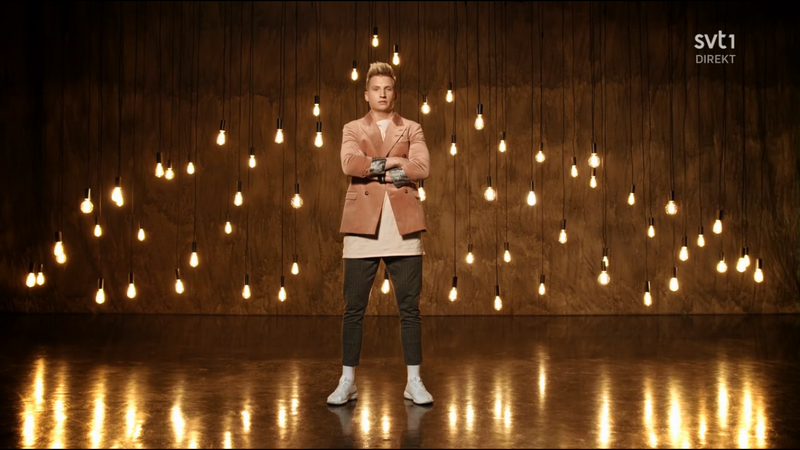 A lively and enjoyable song, but the vocals let it down in places. I hope we see her again though. "Vart Har Du Vart" - Allyawan. 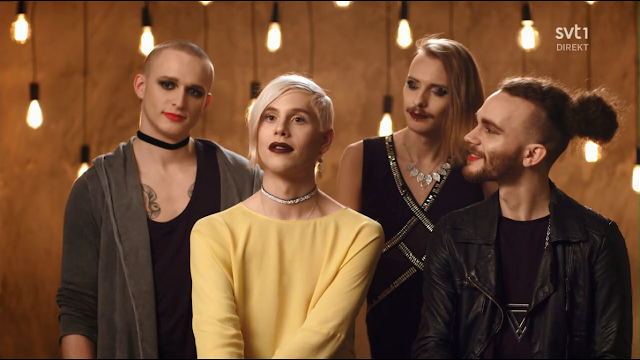 As the picture above proves, Dismissed have a very strong androgynous image and they also had a rather good song which was written by none other than Ola Salo and Peter Kvint. This certainly deserved its qualification place although the visuals maybe just overshadowed the song a bit too much. "I Don't Give A" - Lisa Ajax. 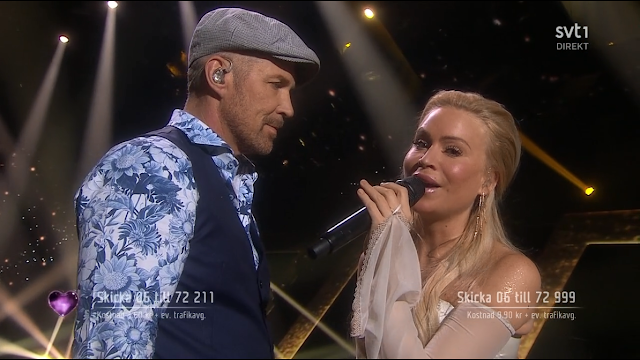 Lisa Ajax made a quick return after last year's debut with an ill-advised potty-mouthed song by team Deb, this time co-written with Ola Svensson. Combined with the egotistical backing screens (which would inspire many a Eurovision participant to later plaster their own face all over the backing LED screens in Kyiv), everything about this was just wrong for me. 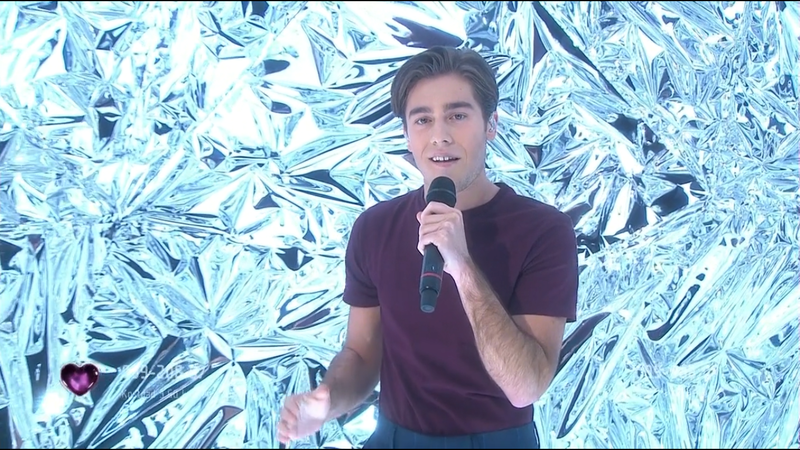 "Good Lovin'" - Benjamin Ingrosso. From a family of Swedish showbiz royalty - the Wahlgren/Ingrosso clan - Benjamin Ingrosso made his debut as a well-known face. 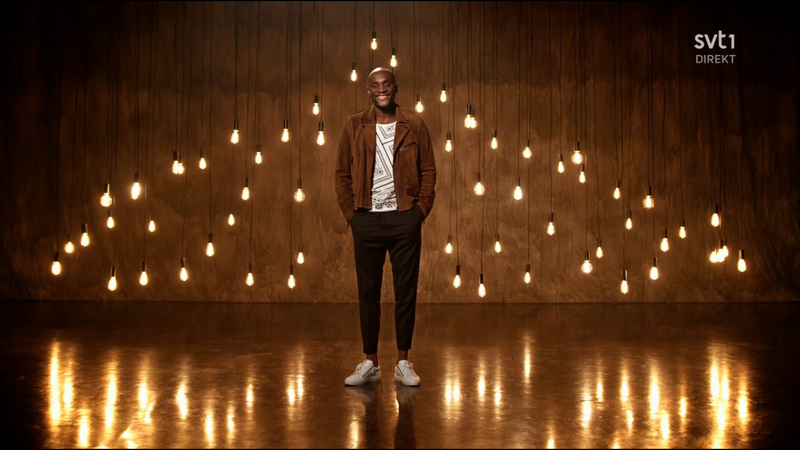 Yet his song was just a pale attempt at emulating "Can't Stop The Feeling", accompanied by some very low-budget staging. This is another one I can't watch without thinking of the Norberg 'parodi' version. 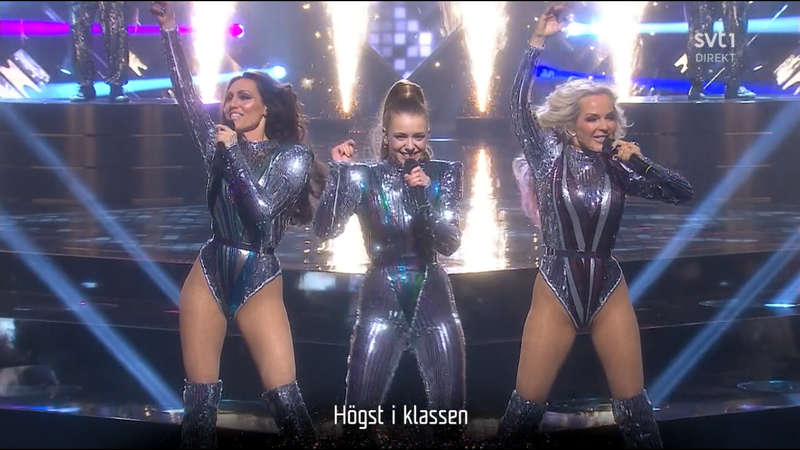 If week 2's songs were a bit of a rather disappointing mixed bag, the real highlight of the evening was to come. 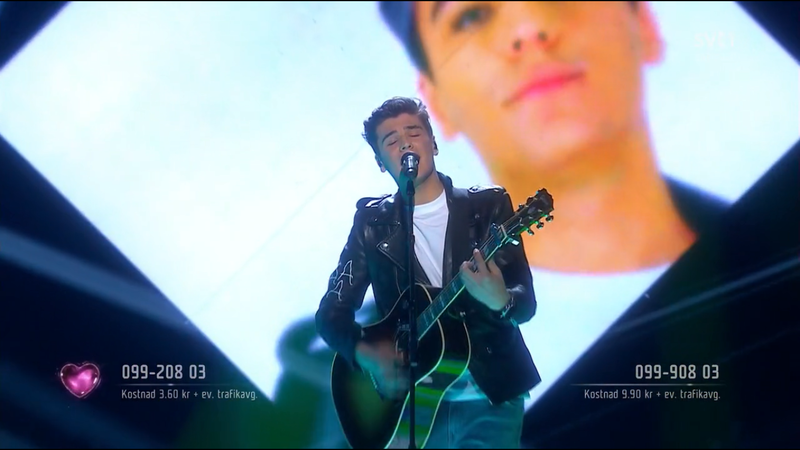 This week's interval act was David Lindgren's "Mellokavalkad", a quickfire and quick-change medley of Melodifestivalen hits, which showed off his impressive vocals and proved he has a great sense of humour too, although that Tommy Nilsson was just a little too cruel for my taste! 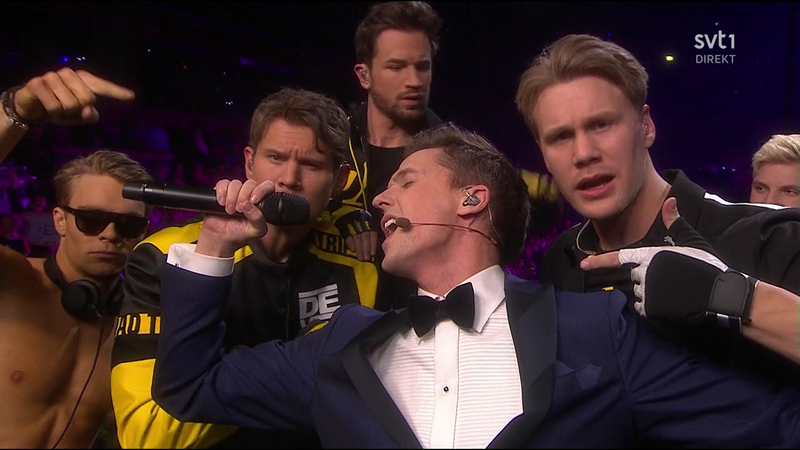 There's nothing Melfest likes more than self-referencing these days, so the second interval act was a song called, I think, "Tack för alla röster".